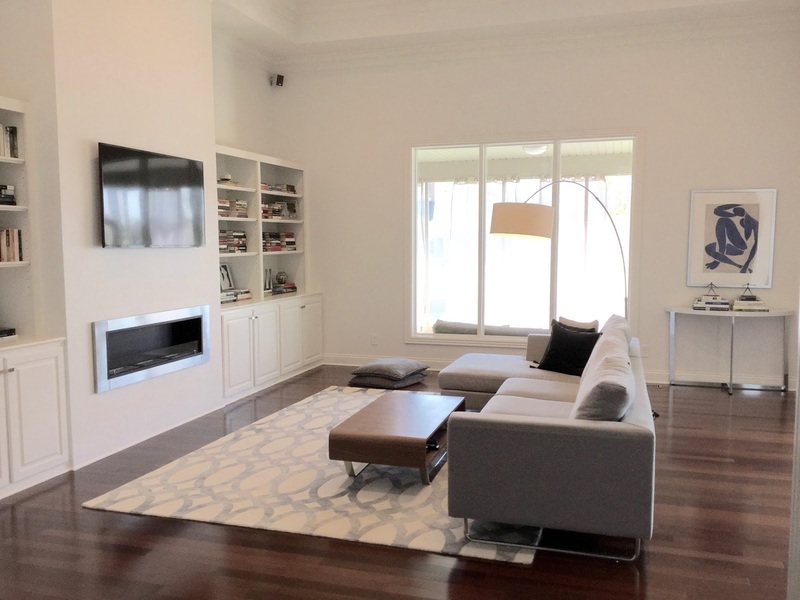 I love a complete full house design transformation. 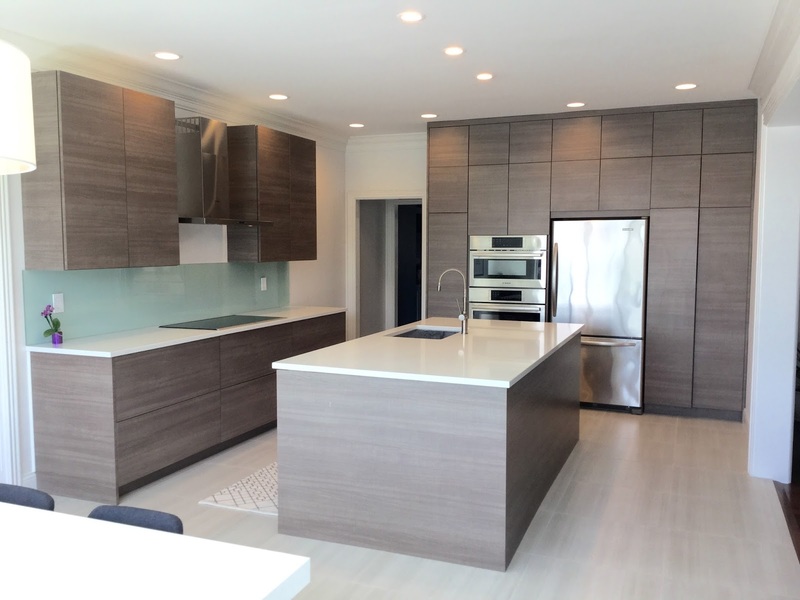 Projects like this one are what keeps things exciting- this traditional to sleek & modern house was such a unique project. My clients wanted the home to better fit their style of design. They knew exactly the look they wanted, just needed a little assistance in putting it all together! This renovation began in the foyer. We replaced the traditional front door with stained wood fiberglass double doors with modern hardware, installed a new modern light fixture, and added a fresh coat of white paint to the walls. 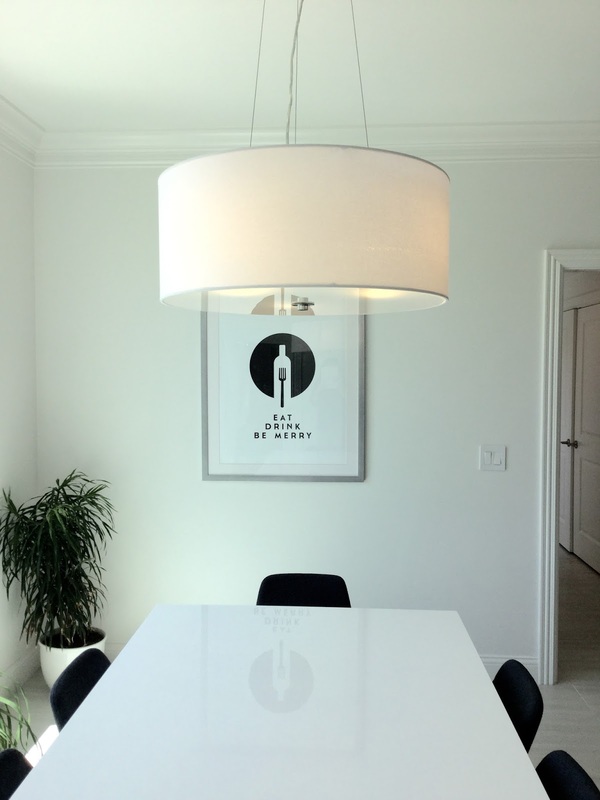 We updated the dining room with some cosmetic tweaks. 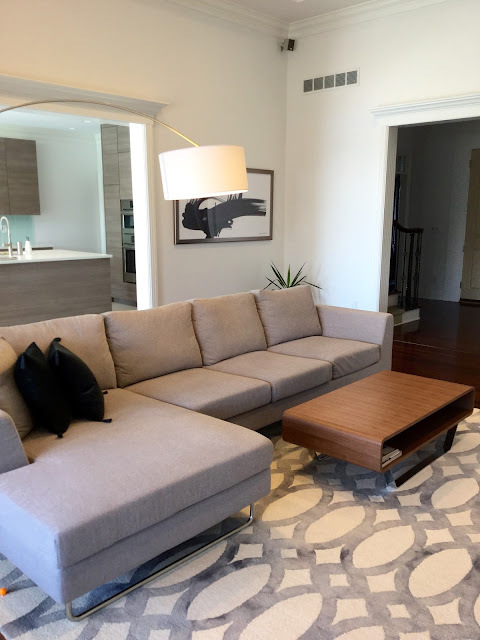 Painted the walls medium gray, added a simple, yet stunning modern light fixture, plus new dining chairs, modern artwork and the rug my client selected really makes this space casual and inviting. The polka-dot wallpaper in the half bath had to go! 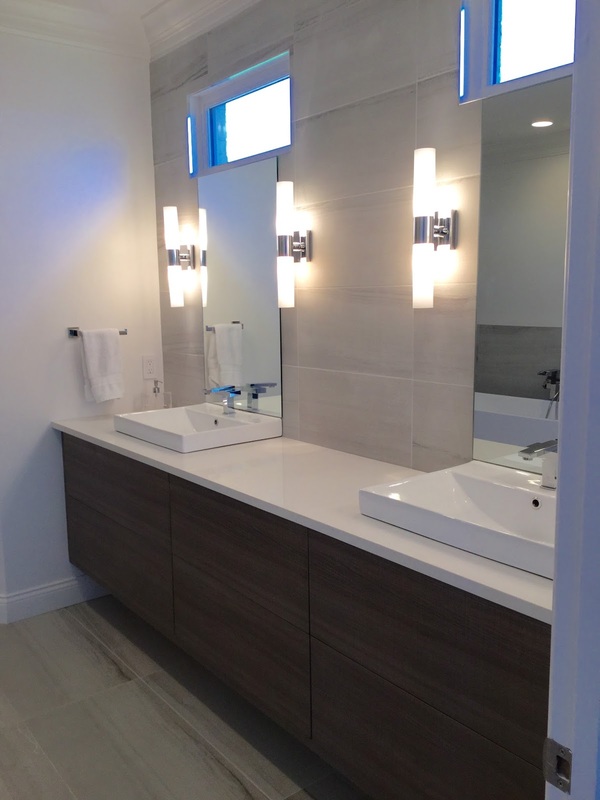 Installed a new custom vanity with a rectangular vessel sink, chrome fixtures, new toilet, modern light fixture, plus the artwork my client selected really makes it pop against the grey painted walls and adds interest to this adorable half bath. 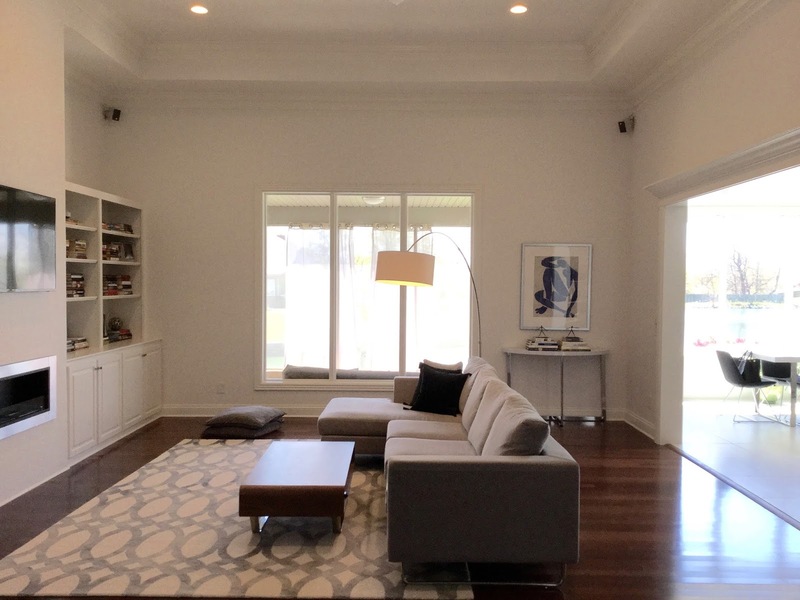 The living room is very inviting with freshly painted white walls and newly installed open glass windows. 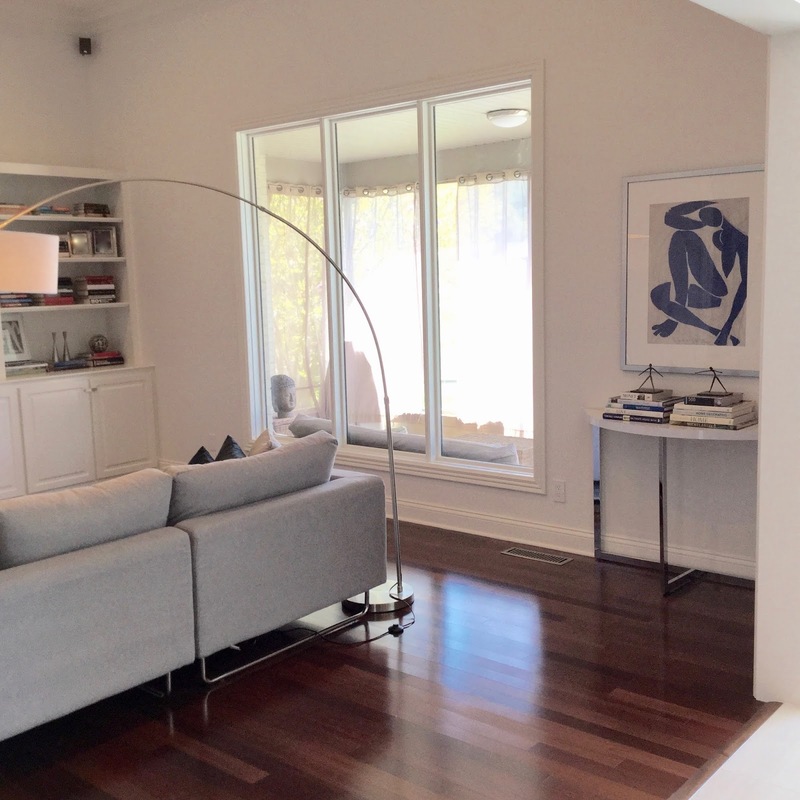 Simply painting a room can make the space feel more welcoming, brighter, and larger. 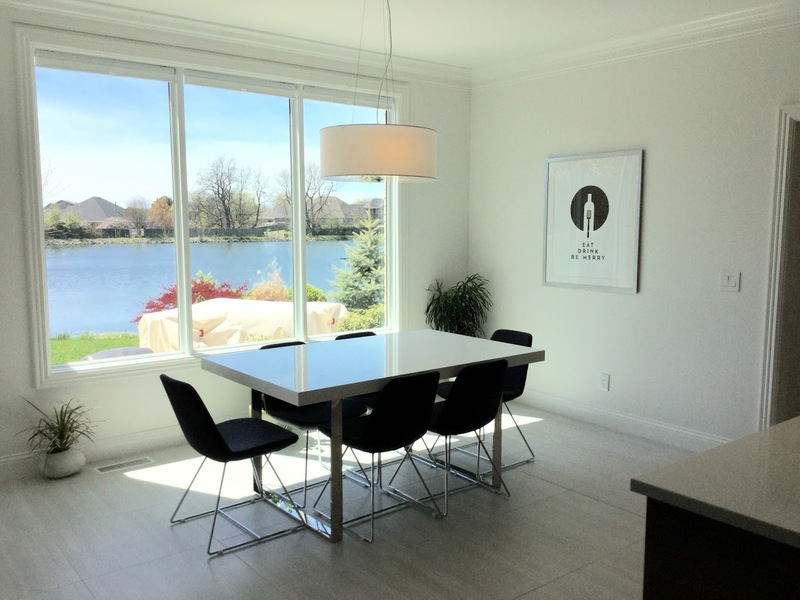 The new open-glass windows in place of the mullion grid windows, now makes the eye expand out towards their back porch and beautiful lakeview, while creating a more modern, airy look. 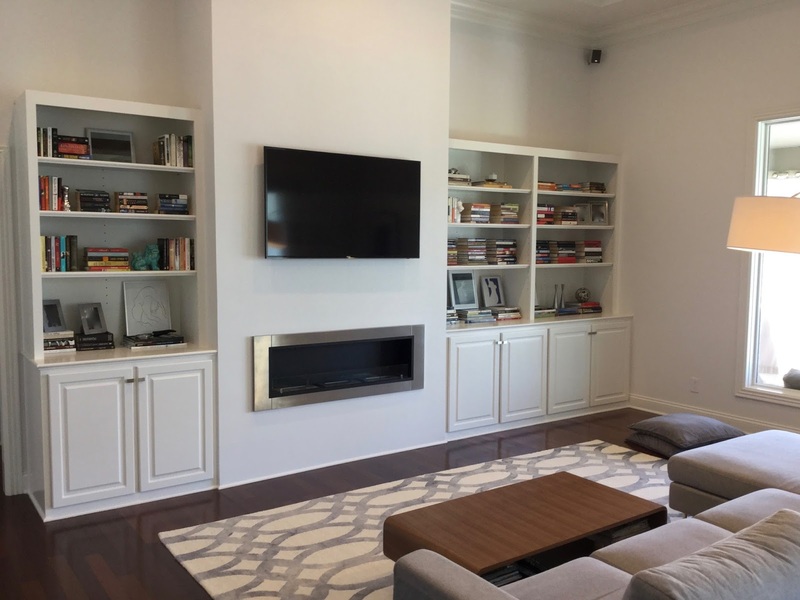 Updating the traditional fireplace to a floating fireplace, filling in the tv niche, and little as removing the arches in the original built-in cabinets really turns this focal point wall into a show-stopper. 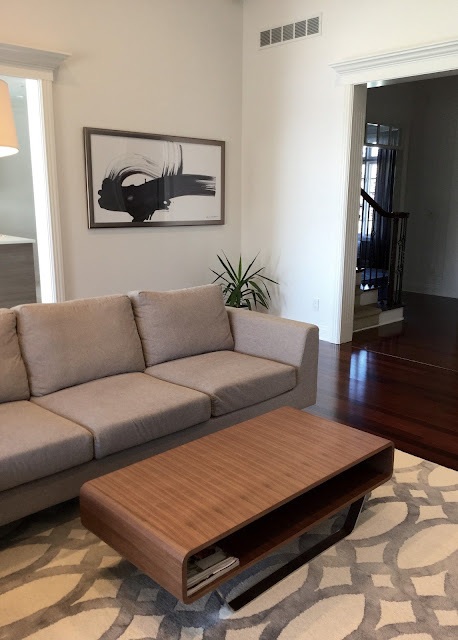 Plus I want to add my client did an excellent job selecting all new furniture, rugs, and artwork to really make this space feel modern and sleek. 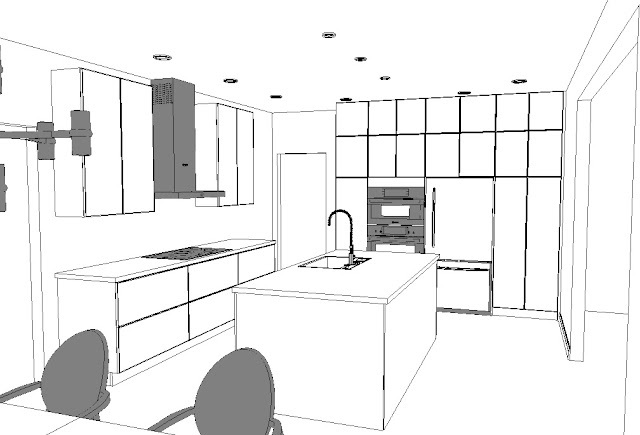 First let me show you all the work it actually takes into designing a kitchen… I started off creating preliminary 3-Dimensional drawings of the kitchen. 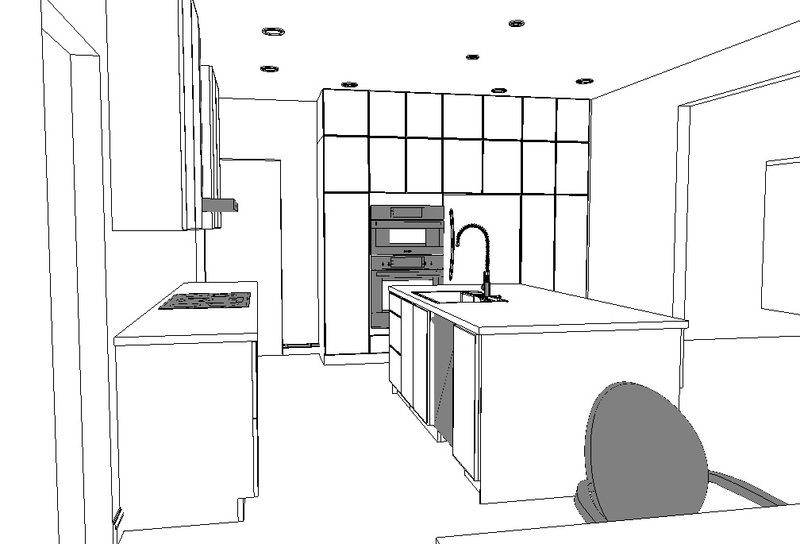 3-Dimensional drawings enable you to visually “walk around” the space and really get a feel as to what your kitchen or home will look like. 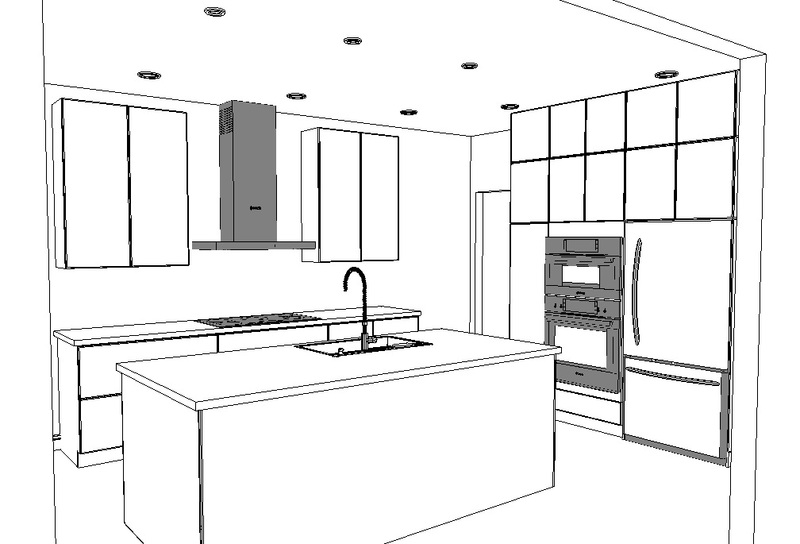 The Kitchen underwent a massive transition, completely reworking the layout from dark and traditional to an open, clean & sleek, but simple design. 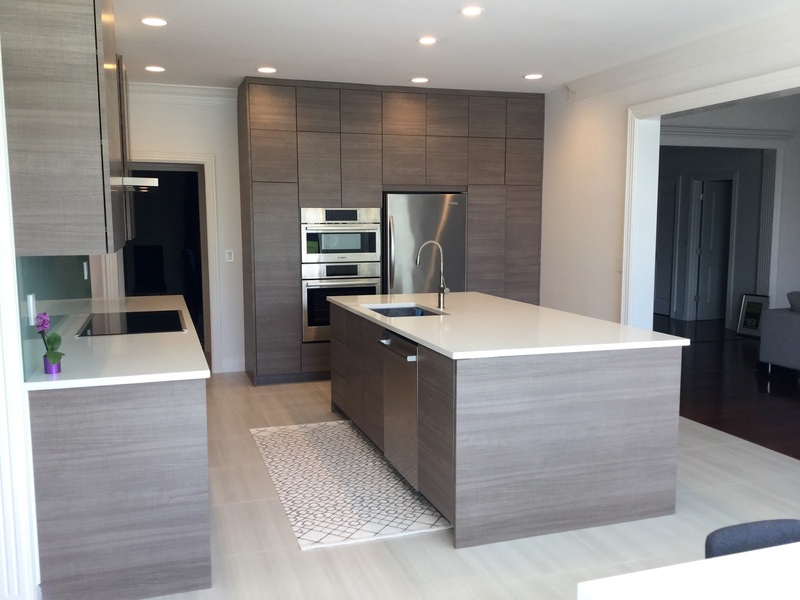 We continued the white paint throughout the rest of the kitchen, installed new large gray tiles, designed a new custom island and custom cabinets for ample storage space. 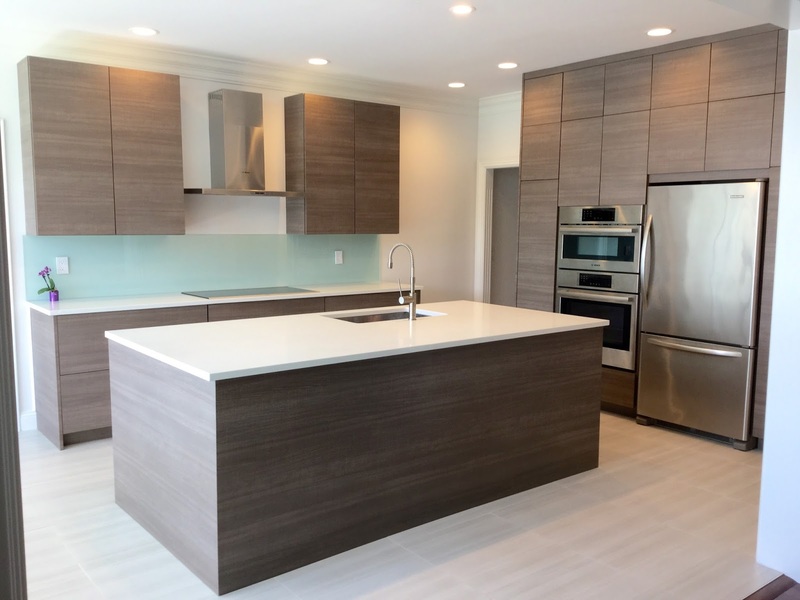 The darker cabinetry makes a bold statement and provides contrast against the white Quartz countertops, white walls, and light gray tiled floor. Another one of my favorite unique details in the kitchen is the frosted glass backsplash my client selected. 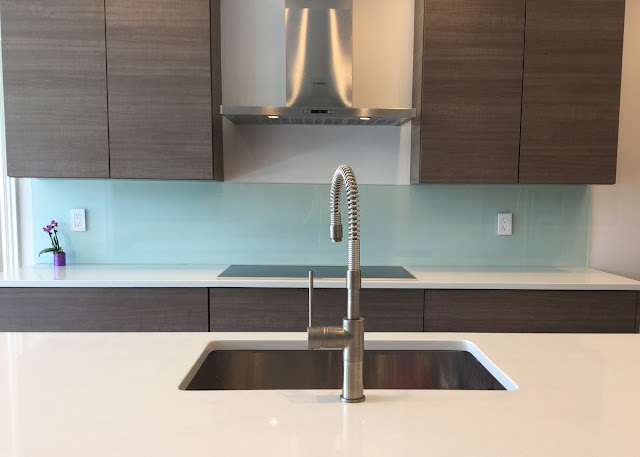 They use glass backsplashes in European kitchens for a clean modern look, it adds interest to the space without overpowering it. To finish off the kitchen, we added new recessed lighting over the island, drum pendant light above modern dining furniture, all new stainless steel appliances and range hood. This kitchen is truly absolutely stunning. 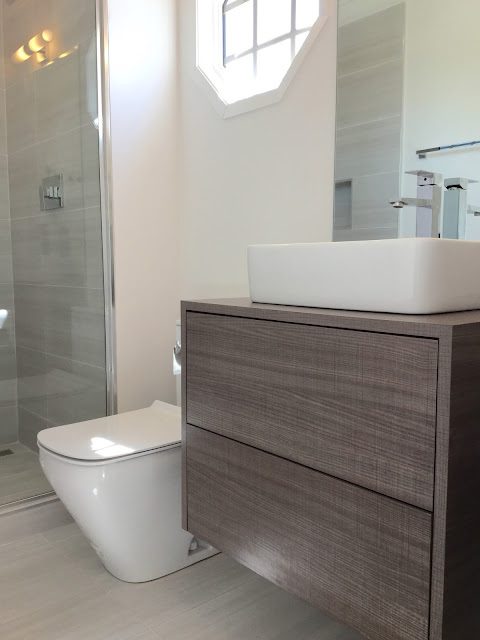 Just like in the half bath, the pool bathroom received a new custom floating vanity with a rectangular vessel sink, chrome fixtures, new toilet, and a modern light fixture. No more closed off shower with surround and frosted sliding glass doors. An all new tiled beautiful walk-in shower with a single glass panel makes this bathroom feel so much larger. 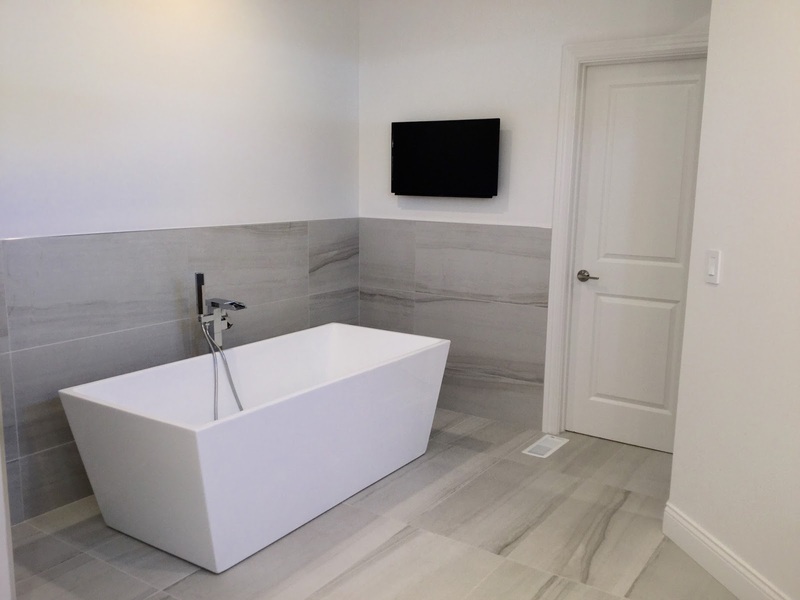 The same tile flooring and paint was continued throughout the hall, laundry, and pool bathroom to keep the rooms consistent and for the rooms to all flow together. The master bathroom received a full facelift. Focusing on the vanity wall and incorporating the small windows into the design, we wanted to get creative with this to really make it a focal point when first walking into the space. Continuing the same tile from the floor onto the vanity wall but in smaller size really makes this wall stand out and the overall space flow together nicely. 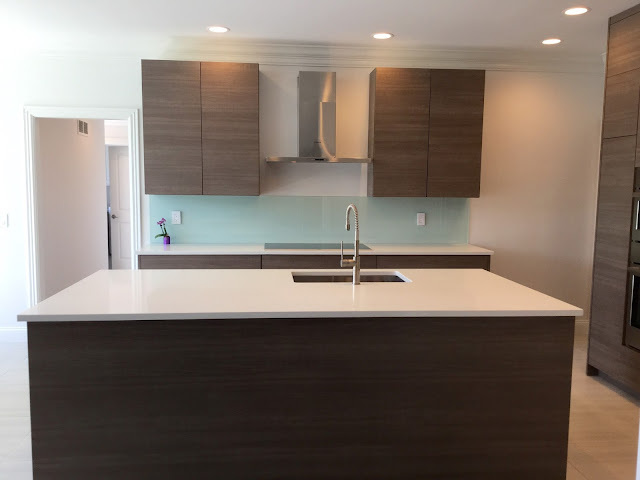 The custom floating double sink vanity with large rectangular sinks, chrome fixtures, and white Quartz countertop adds a modern element to the space. We also added modern sconces on either side of the vanity mirrors plus additional recessed lighting for ample light. 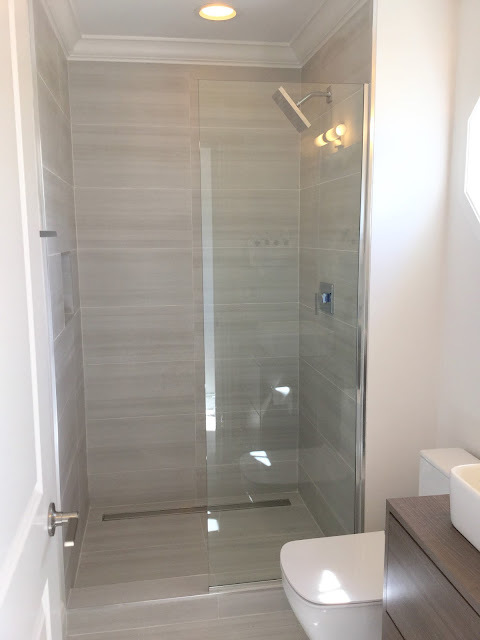 No more arches and columns in this master bathroom, continuing the large floor tiles in a stacked pattern up the wall to surround the new free standing tub with chrome fixtures fills up this existing space nicely. To stay-on budget, we decided to keep the master shower’s original footprint, rather than rearranging the plumbing lines. 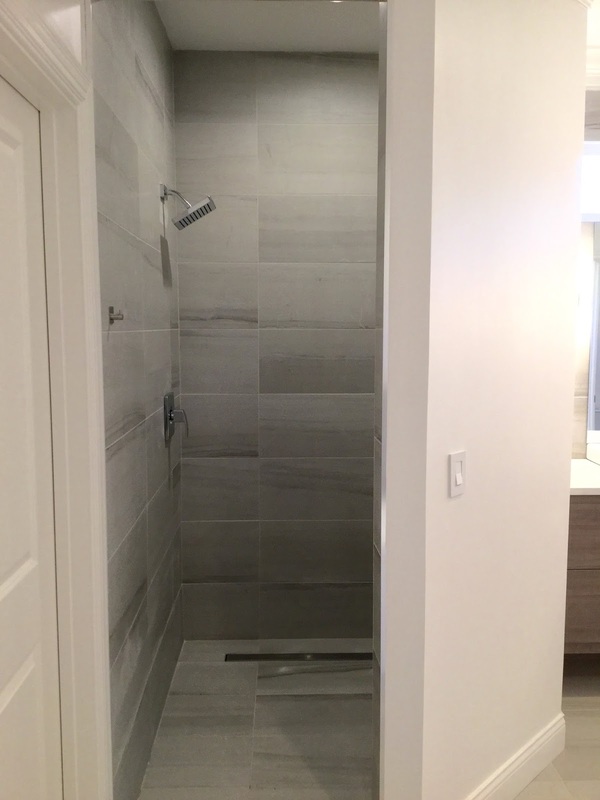 We moved the shower entrance to the other side to create a spacious luxury walk-in shower. This bathroom is truly one of my favorite projects to date! 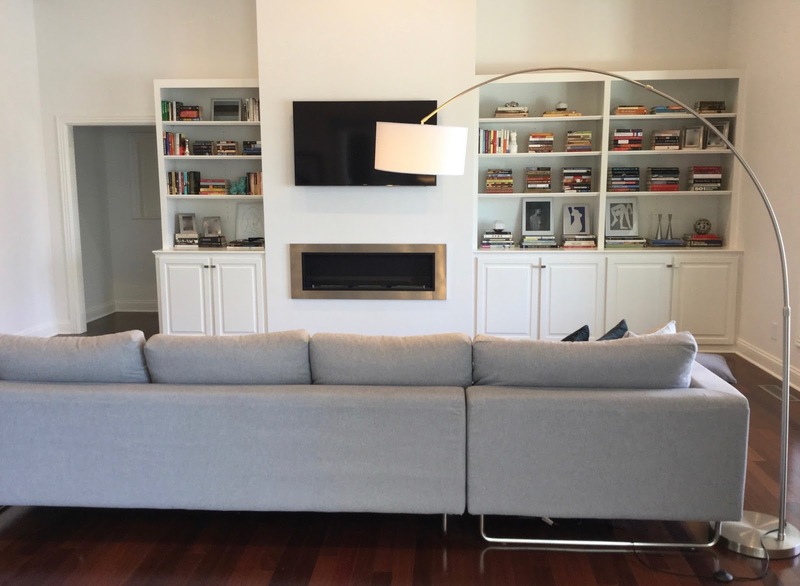 Now the home is both open and inviting and my clients love it! 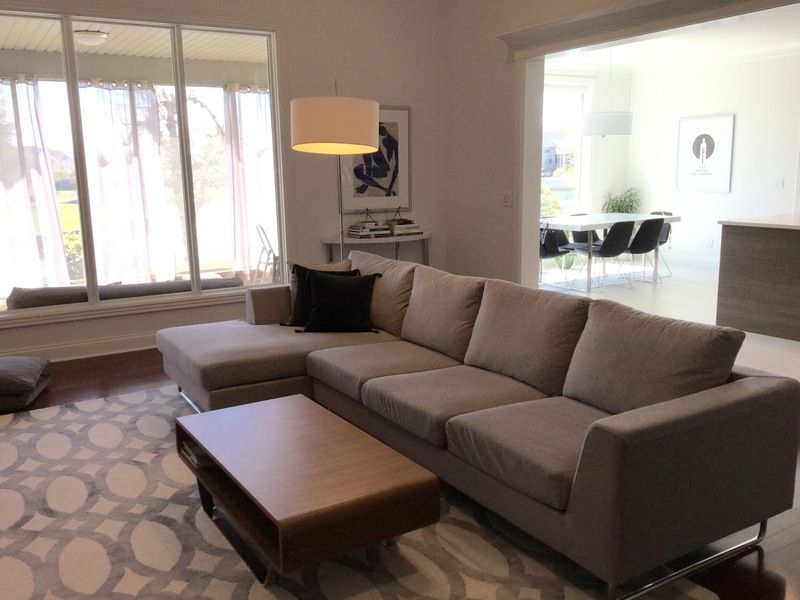 I enjoyed helping them make their design vision a reality… a beautiful modern sleek home for that fits both their style and their needs! To see more before pictures click here. To see the side by side before/after pictures click here. 8 comments on "THE MODERN HOUSE REVEAL"
All the rooms of your modern house is so beautiful..from dining area to bed room all were super cool with some extra classic furniture. I LOVE how modern and cohesive this all looks! I am wondering if you could share the name of the bath tiles?